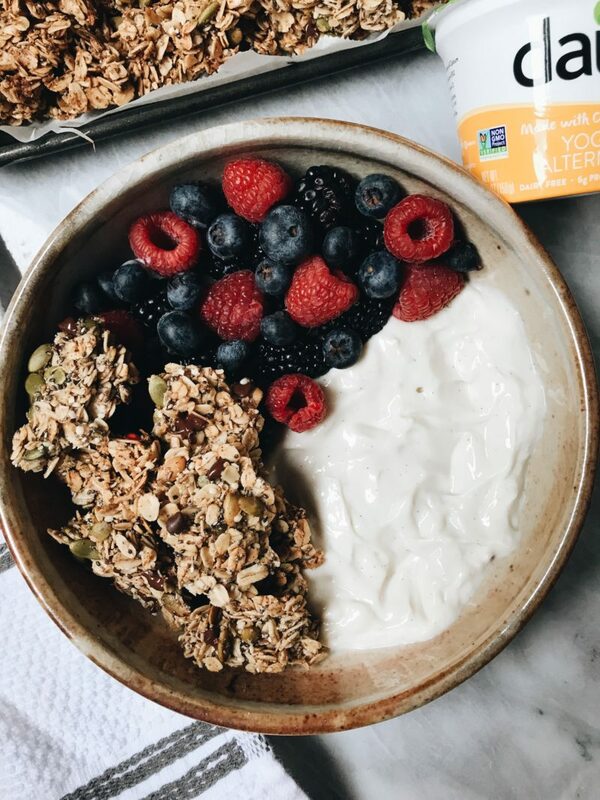 Start your mornings with this delicious Vegan yogurt bowl with nut-free granola and fruit of your choice! Being a Vegan with allergies can be difficult, but it also takes creativity. As a Vegan allergic to peanuts/tree-nuts, I can fully acknowledge and say that a lot of Vegan products on the market contain some type of nut. I would say most popular nut used in many Vegan products are cashews & almonds. Also in general, most store bought granolas contain nuts. It is rare to find a nut free granola. I usually will make my own as it is super easy to make and easy to control what you want to add. So I am really excited about Daiya’s Coconut Cream Yogurt Alternative. 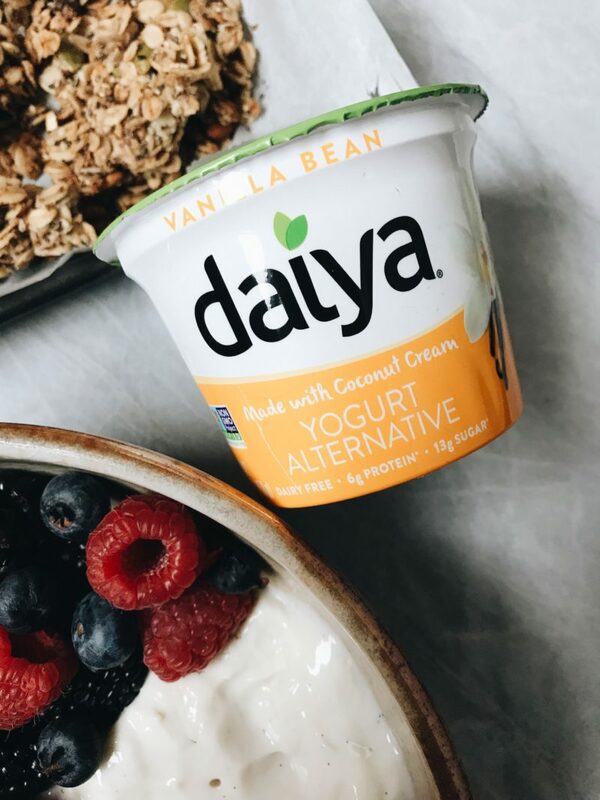 It is one of the few yogurts on the market that is completely nut free (as well as all of Daiya’s products). They are lower in sugar compared to many vegan yogurt alternatives on the market, and real fruit is used in their flavors. The flavors include: vanilla bean, plain, peach, strawberry, blueberry & black cherry. 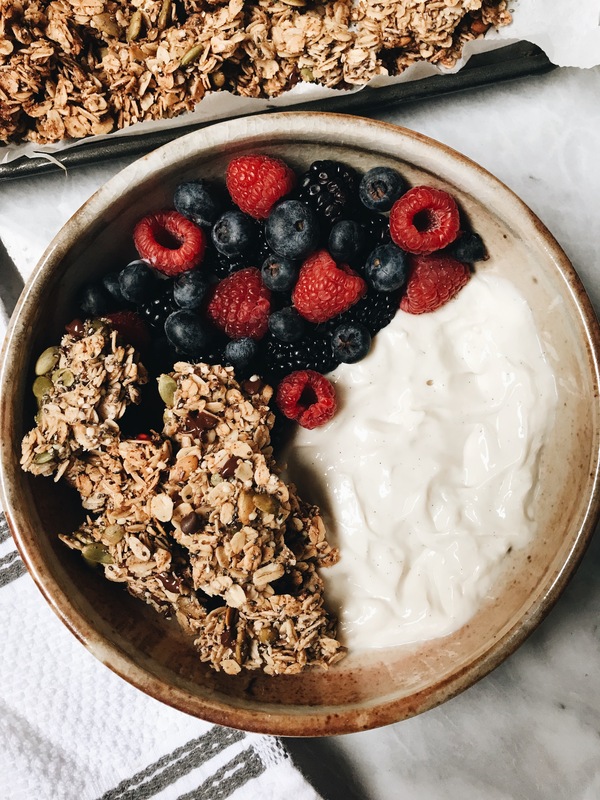 In this recipe I went with the vanilla bean and let me tell you there is nothing more satisfying than seeing the little specks from the vanilla bean in the yogurt. 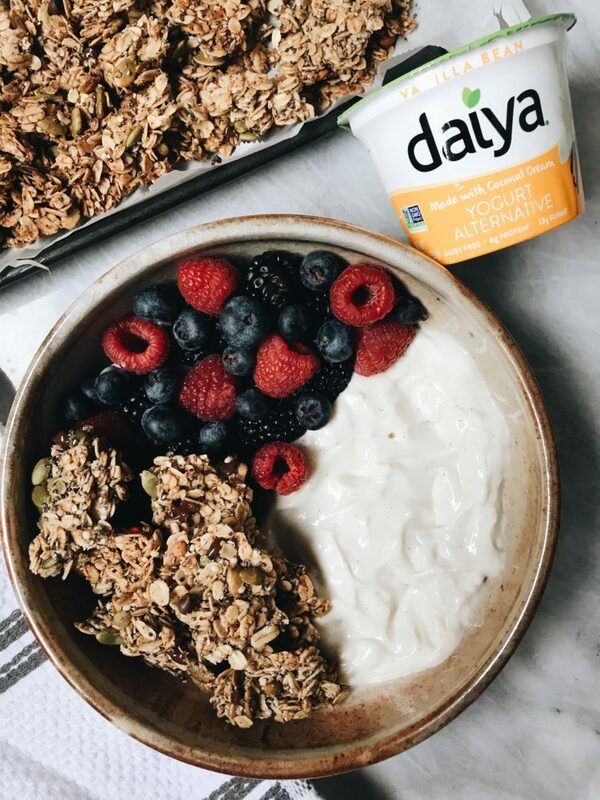 Daiya yogurt’s have live vegan cultures and vitamin D & B12. They are also soy & gluten free if you are intolerant to any of those allergens. The fruit varieties have up to 9 grams of sugar using fruit and vegan cane sugar, with the plain having only 3 grams of sugar. To pair with the yogurt, I have created a recipe for these nut-free granola clusters. It’s easy to make and perfect to prep for the entire week/up to 2 weeks. Find where to pick up any of Daiya’s products here. Begin by making your granola. Pre-heat your oven to 350 degrees Fahrenheit. In a bowl, combine your oats, pumpkin seeds, shredded coconut, flax, hemp seeds, chia seeds and cinnamon. Mix well. Now, mix in your wet ingredients. Add your maple syrup, coconut oil & vanilla extract. Fold in the wet ingredients so all your dry ingredients are well coated. Add to a baking sheet lined in parchment paper. Press down so all your ingredients are in one layer. Bake in oven for 30 minutes turning the baking sheet halfway. Allow the granola to cool for 20 minutes before topping with your chocolate chips. Break up your granola to create small clusters. 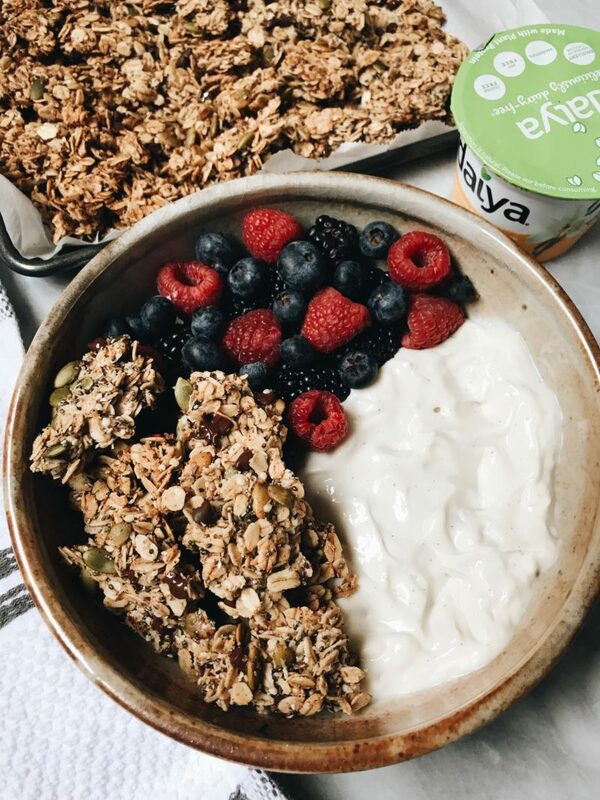 Add in a bowl your Daiya yogurt, mixed berries & granola clusters! Serve. Place in air tight container for up to 2 weeks. Thank you to Daiya for sponsoring this post. It means a lot to me to work with brands I love and who support my blog!